You can find a few steering w/airbag on ebay or you can part it out like I did which saved me more $. 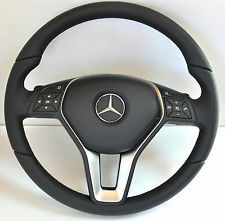 Steering wheel A172 460 2803. There was also 9E38 written after the part # on the steering wheel but not sure what they mean. 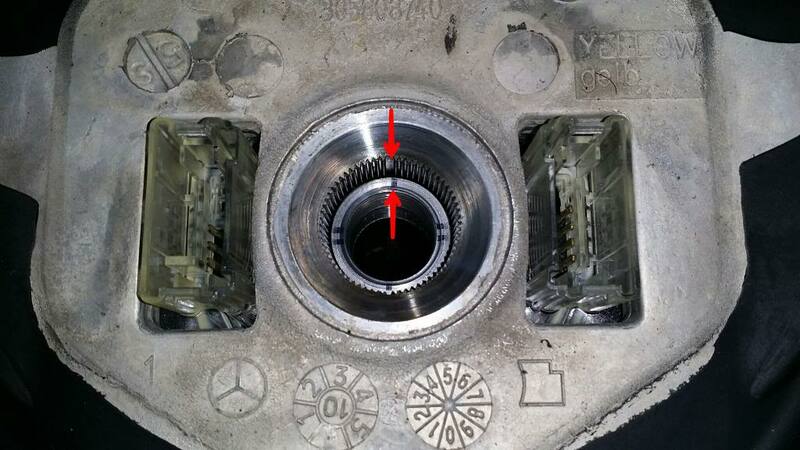 It was taken off a CLS according to the seller. AMG airbag for C C63 CLS 63 E63 CLK SL W204 W218 W207 R231. AMG ONLY! This is important. Non AMG airbag is for a 4 spoke steering and will not fit. Thanks to MDMercedesGuy for pointing this out to me. 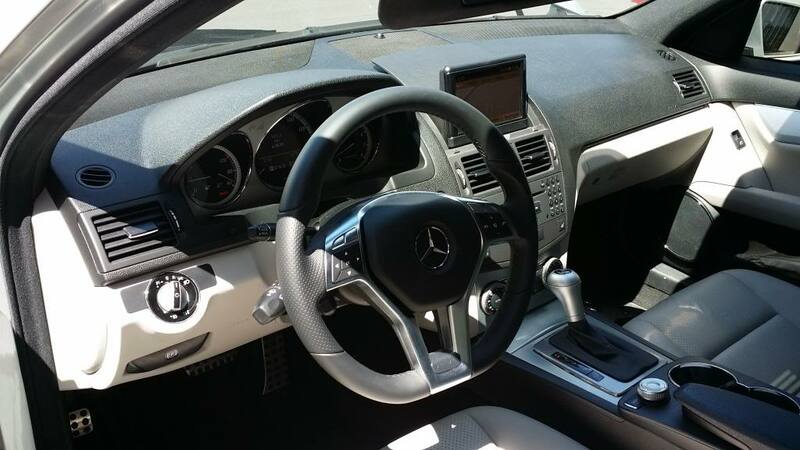 It looks like there are 2 type of amg steering wheels. I bought steering wheel 1 below but with airbag 2 so there's a gap on the bottom which I can live with. I've also seen some selling steering w/airbag in this setup so pay close attention to the images they provide or ask them a question if you're unsure. 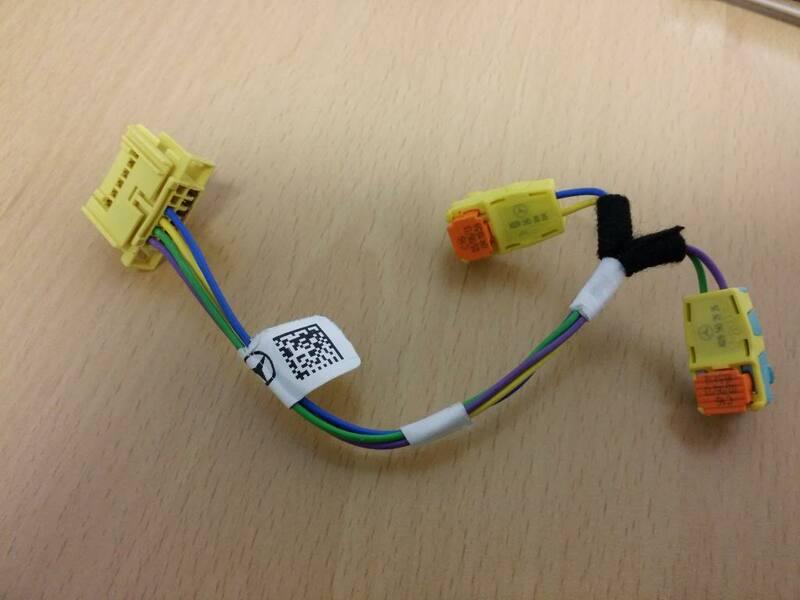 Either one you buy make sure the airbag has this connector included. You will have a hard time finding one of these otherwise. ***Again if you buy a complete set, still pay attention to the airbag as I've seen some still with wrong airbag. 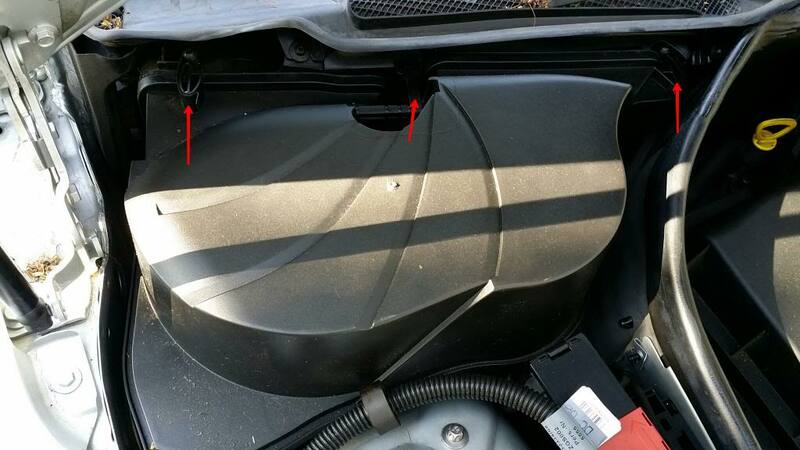 The battery is located under the air cabin filter box under the hood. It has 3 snap on clips. 2 on the sides and 1 center. I forgot to take a picture of this one but this one shouldn't need it. But once the battery is exposed, use the 10mm socket wrench to remove the negative terminal from the battery and make sure to put something in between the negative terminal and negative post on the battery so they don't touch. I used rubber gloves. 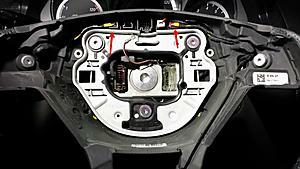 If you don't disconnect the battery you will get an airbag error which only the dealer or Mercedes tech can clear. So do not skip this step. Now for the steering wheel removal. Turn the steering wheel left and so the steering locks. This will be useful later. Locate the steering mount holes located on the back of the steering. There’s one on the left and one on the right side. Use the T30 torx screw to loosen both torx screws all the way. Slowly lift off the airbag from the steering wheel so you don’t accidentally yank on the airbag and steering cables. You will see these 2 connectors on the steering column (brown & yellow). Hold the airbag or have someone hold it for you while you remove these connectors. There are 2 tabs you need to push in to unlatch the connectors and then just pull the connectors straight out. 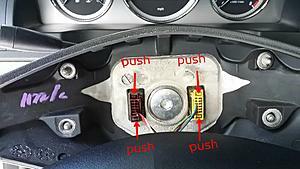 Once the original airbag is removed, you will have better access to the bolt that holds the steering. 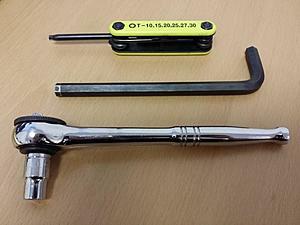 Remove the center bolt using the 10mm allen wrench. It might help if you use the socket wrench you used earlier for the battery as a lever. 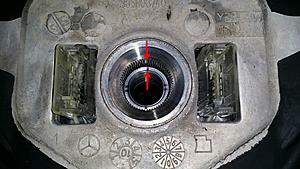 Long end of the allen goes to the steering bolt, while the short end connects to the socket wrench. And unscrew that sucker. 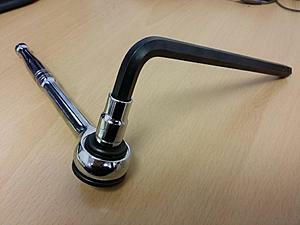 Remember earlier, you made the steering lock. This is where it's useful if you don't have any to help or tools to hold the steering wheel. Now give it all you’ve got! It will be tough to remove but I didn’t give up. Just make sure you are pushing on the allen wrench at the same time so you don’t slip or end up stripping the bolt. Sorry I was working solo on this one so I couldn’t take a picture as I was trying to remove the bolt and didn’t want to drop the tools into the steering and scratch it. Once the bolt is removed, pay attention to the marker inside. 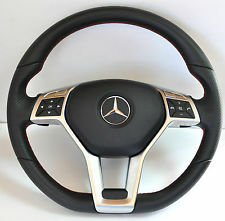 When you put your new steering wheel, it has to line up the same way or your steering will be off centered. Put the steering wheel on and again make sure you line it up exactly how the old one was. I recommend you use lock tite on the bolt. Put the bolt back on. Make sure the bolt is on there tight! Reattach the brown connector from the steering. Grab the new airbag and attach the yellow cable to the steering column. Tug on both wires to make sure they are clipped in good and won’t come off. 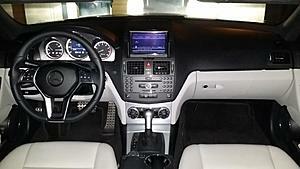 Line up the airbag and just press it in till you hear the left and right side click in place. Reattach negative terminal on the battery. *** The paddles shifters worked on the new steering wheel for me even though my stock steering didn’t have them. Not sure this is true for all cars. So YMMV on this one. Last edited by aznmode; 05-09-2014 at 03:35 PM. This is good news, I also own a 2010 c300 sport. I think I will do it just for the paddle shifters. Was the install plug and play? Plug and play. I spent total of $665 for everything. I had to keep looking and waiting for a deal on ebay. Last edited by aznmode; 05-05-2014 at 11:12 PM. When you were searching eBay did you ever come along a beige colored one? Not one unfortunately. Not sure they come in beige. Maybe brown? Brown for the "Almond" interior. Interest, where do you connect the 2 cables from the paddle shifters? I just switched to an E class coupe steering wheel and can't find where to connect the shift paddle cables (my car didn't come with the paddles). 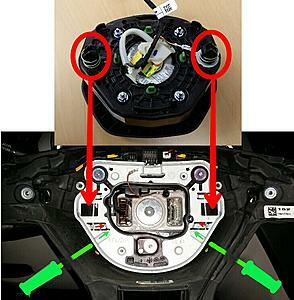 In the picture below you can see the 2 connectors in question for the pre-facelift steering wheel. From my research the connectors is plugged into the button pad on the airbag then the whole thing leads to the dark red plug then gets plugged into the clockspring. my prefacelift airbag does not have a spot for the paddle shifter plugs so they were left hanging. As the facelift wheel has all the button on the silver trim already, I believe there's no separate plugs and therefore making it possible to use the paddles? Time to look for a good deal on the FL steering wheel to give this a try, thank you. That's A Good Question. 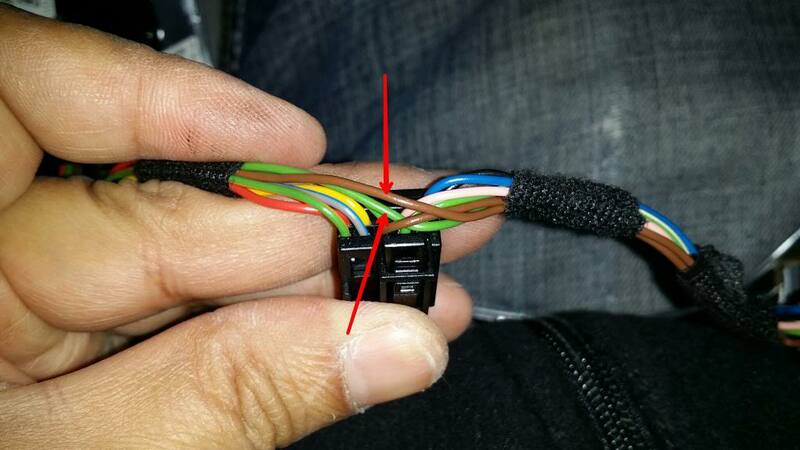 There's only 3 wires on the brown (dark red) connector so ya it looks like it's wired to the steering wheel internals. Also I read on another thread the c63 paddles polarity is reversed. So it looks like I suffer from non illuminated buttons just like every other SW swap. I have a feeling it's a polarity issue since it's using led. So I'm gonna see if I can trace the wire tomorrow and reverse it. No luck with the button lights after taking the silver trim off. Theres a connector which plugs to the steering wheel base that splits into the left and right buttons. There's a brown and green wire that splits to both sides of the button harness so I figured those are the wires for the light. I reversed them and no go. The rest of the wires are unique on each side so I didn't mess with those. I guess I'll need a w212 steering column if I really want them to work. Last edited by aznmode; 05-07-2014 at 06:54 AM. I pm'd you this but this is what I saw after removing the silver trim off the steering. 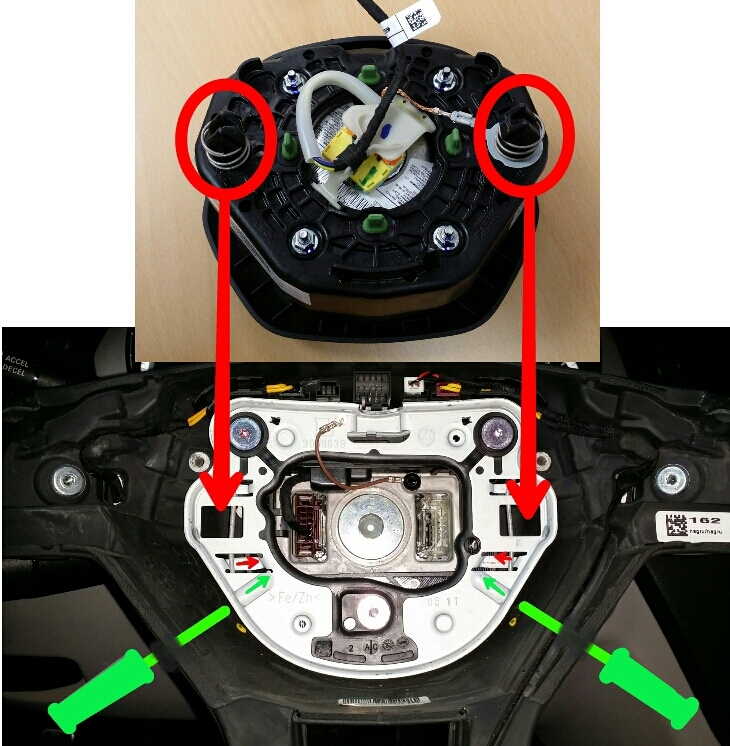 Arrows point to the paddle connectors. Updated the OP. It looks like there are 2 types of amg steering wheels. I bought the 1st steering but 2nd airbag. So I might get an airbag cover to convert mine to the right one (first one). The DIY doesn't change however. Last edited by aznmode; 05-07-2014 at 06:03 AM. WHen you say press the new air bag until it "clicks into place"...are you saying that the airbag isn't held on by any bolts, and that I can simply just yank it out by force? I have a 2012 C350 with the same wheel and would like to take the airbag off to trouble shoot a rubbing noise that I "think" is comming from wires under the airbag. 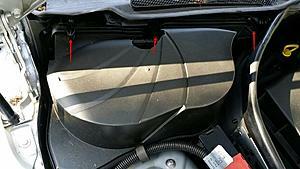 See my post #2 in the below thread for additional info how to remove FL airbag. Here's another diagram. Basically no screws. 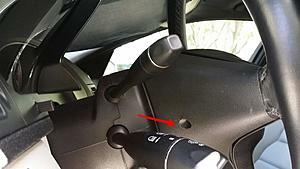 The 2 arrow shaped posts on the airbag goes into the 2 square holes on the steering. Tension spring bar locks the airbag in place when you install the airbag. To release airbag, stick a torx or allen screw through the 2 dimple (left and right) on the rear of steering to bend the tension bar. The spring on the posts will push the airbag out automatically once the bar is pushed in enough. Last edited by aznmode; 05-07-2014 at 08:17 PM. ...Basically no screws. The 2 arrow shaped posts on the airbag goes into the 2 square holes on the steering. Tension spring bar locks the airbag in place when you install the airbag. To release airbag, stick a torx or allen screw through the 2 dimple (left and right) on the rear of steering to bend the tension bar. The spring on the posts will push the airbag out automatically once the bar is pushed in enough. Thank you, appreciate the information. At this point I'm pretty sure the paddles could work for prefacelift wheels, just need to figure out where the wire leads to (and the pin connector layouts). 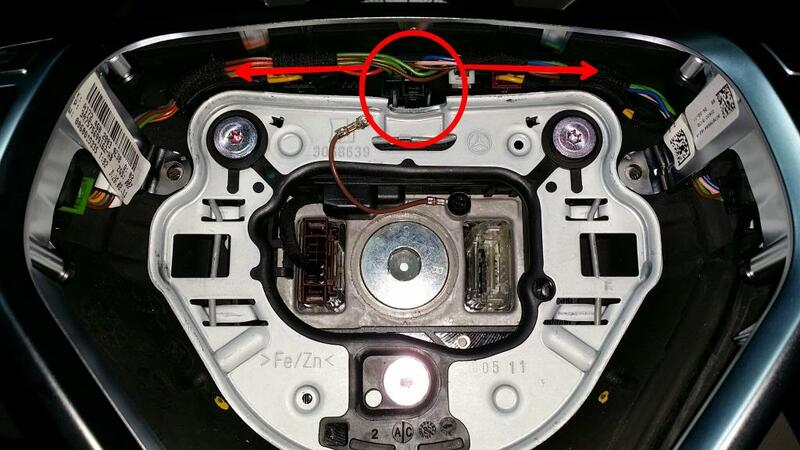 So after some digging around I found this post on the C63 forum on how to make the lights work. Going to try it tonight but I hope it doesn't disable my paddles. Basically put the motherboard from the old steering in to the new FL steering. I think I found the answer to your question. Noticed this when I was trying to remove the circuit board from the pre FL airbag. 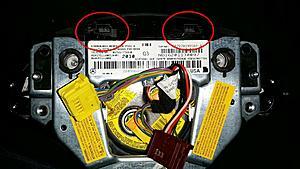 If you look on the back of the airbag, do you see these connectors on the top on yours? I'm pretty sure these are where the cables from the shifters plug in on the pre FL. It's part of that board I'm trying to remove and the harness from the side buttons all go into this board also. Last edited by aznmode; 05-08-2014 at 10:03 PM. 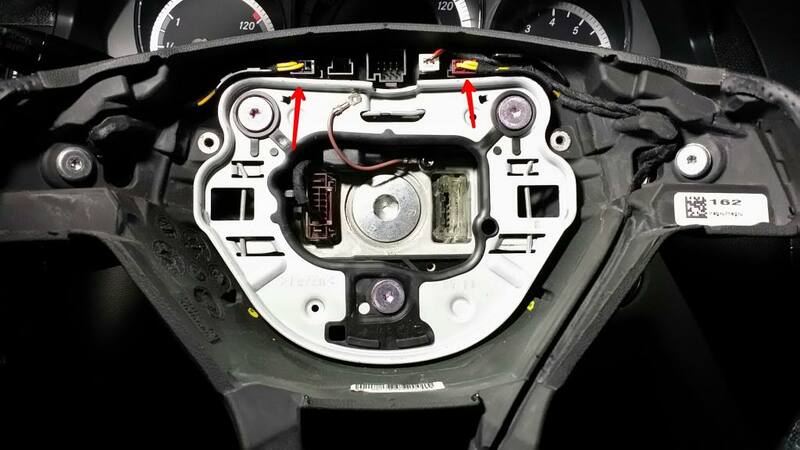 Contrary to my PM, I was curious enough to remove my airbag and take a look and the ports are there. All I had to do was plug the wiring harness from the shift paddles (I had a E-class coupe flat bottom wheel with paddles) to the ports and they worked right away! No luck with the board swap. They're not identical and have different connectors. I should've snagged the steering column I saw yesterday on ebay but someone beat me to it. Anyway, I'm not sure the validity of this info but this is the 2nd one I've read that the button lights can be reprogrammed in. So I'm going to take it to my tech monday and see what he can do. I've also update the OP with more images. Last edited by aznmode; 06-10-2014 at 04:02 PM.